I think the political quote of the week comes from the anonymous pundit who reported of Rochester and Strood: "Labour suffer crushing defeat by losing safe Conservative seat to Ukip". But he only just caps Mr Eugenides, who tweets: "Stupid woman tweets photo of white van and flags, resigns. Stupid man calls for compulsory repatriation of legal EU residents, is elected". Turnout is reported at 50.67 percent, against 51.13 percent at Clacton. Reckless thus came in with 16,867 votes, representing 22.5 percent of the electorate - one in five of the voting public. This is significantly down on Clacton where Carswell took 30.5 percent of the popular vote. We are seeing yet another failure of the Angry Party to set the election on fire. That Ukip was going to win, though, has not been in doubt for some time, which means "death camp" Reckless the Repatriater is briefly returned as MP - albeit the indications are that the margin will not be as great as some expect. His tenure will perhaps last only until the general election. But his move to Ukip will bring no tears from Peter Oborne. He describes the Repatriater as "a brutish and low-grade specimen who ought not have been permitted to stand in the Conservative interest". His defection to Ukip nearly two months ago, Oborne adds, "reflected well on David Cameron's Conservative Party, making it a better place". Interestingly, Reckless will be addressing the Bruges Group annual conference in London on Saturday. He was invited while he was still a Conservative MP and, if he turns up, will be able to put his views on his change of heart to a discerning audience. By coincidence, this will be followed on the Monday by Owen Paterson, who is planning a major speech on the EU. Oborne expects Mr Paterson "to develop the argument that Britain's future lies outside Europe", and that may well be the case. If Mr Paterson goes further and outlines details of how we should go about leaving the EU, he will be ramping up the pressure on UKIP which, after 20 years of existence, is still unable to deliver a coherent (or any) EU exit plan. And, trailing in the wake of the Guardian, which led the fray in noting the great UKIP policy vacuum, we now see the Telegraph picking up the same thread. "The party can no longer get away with simply behaving like the outsiders of British politics", the paper says, "free to dish out criticism but outraged when it is directed towards them". It adds: "Over the next few months, their policies on every issue should be subjected to the closest possible scrutiny". This is an interesting observation. We have been known to remark the Ukip supporters, uniquely, seem to believe that their party should be immune from criticism. Now, the Telegraph lends its way to a counter view. Meanwhile, we are being regaled with rumours of additional Conservative MPs deserting to the policy-free UKIP, maybe attracted by the relief of not having to remember what your party's policies actually are. However, we are now past the six month cut-off, which means there will be no more by-elections this side of the general. 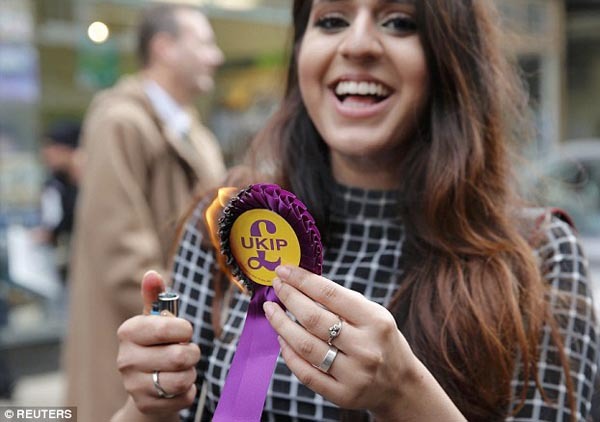 Any MPs who do jump ship and follow the Carswell-Reckless model in resigning their seats are likely to be out in the cold until May – or even longer – reduced to burning their rosettes. At least, now, we are spared the sight of prancing politicians and prattling pundits giving us the benefit of their ignorance. Instead, we can revel in Mr Kelner's claim that other parties haven't a clue how to beat Ukip – until Monday, that is, when we may get an illustration of how policy trumps vacuum.